The men joke on the tee. Snorting. Guffawing. Spitting. Scratching. One says gruffly, “Y’know what Golf stands for, right? Gentlemen Only, Ladies Forbidden!” He and his cronies chuckle. He stands up to the tee and sends his ball approximately thirty miles… into the woods. The little lady was forced to golf with them. She ignores their jokes and quietly walks up to her teebox, ignoring one of their comments about it being closer — even though his first shot is just to the side of the red blocks. She steps up, swings smoothly, and sends a shot only about 170 yards… right down the middle. Use your nice swings to your advantage, laugh at our egos and overzealous muscle shots, and keep cracking that ball straight as an arrow. We men make excuses and gripe about it, but while we’re looking for our ball and whacking grass and trees like jungle explorers, you’re patiently waiting for us in the middle of the fairway. These club sets are for you. Whether it be inexpensive “value” sets or high-end name brand stuff, these clubs were designed with you in mind. Often, these sets have shorter lengths and higher lofts — although these are not absolutely necessary. They often come with a driver, usually a 460cc which gives a tremendous amount of confidence. A bigger clubhead can often produce a more generous sweet spot and even help with distance. The sets also usually come with a good collection of irons and even hybrid clubs, which can help with those longer second and third shots. They usually even come with a putter, although many ladies (and men for that matter) are more satisfied looking for their own specific putter, as they are quite a personal choice. The only other noted difference with some of these clubs are the nice color choices some of them come with. Consider the Top Flite Lady XL Full Club Set, or if you’re into purple instead of pink, you might like the Ladies Full Golf Club Set, Petite S5. No matter what you choose, you can be assured of one thing: you have just about every club that you’d ever need on the course when you get one of these sets. Now all you do is step up to your teebox, take a nice smooth swing, and smack that thing down the fairway. "Hey you… Yeah, you… Come over here. In this dark alley. You wanna to buy a set golf clubs -- CHEAP?!" This is a decent starter set for the ladies. 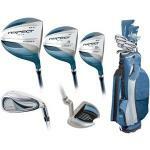 It comes with a driver, a 5 wood, two hybrids, 3 short irons, a putter, and a bag. All the clubs are designed to be forgiving and help beginners improve. I usually don't like the combo starter sets, but these Adams A7s are an exception. They are designed for you ladies that are looking for an entry set so that you can get started in this great game of golf. Are you having trouble finding golf clubs that fit you? Here is a great starter set for the petite lady golfer. This has everything you need to walk out to the first tee. I'm usually not a big fan of these combo starter sets. I'd rather have you spend your money on a couple clubs that are going to be with you a while than a bunch of cheap clubs that you are going to grow out of in 6 months. Are you shopping for a good set of golf clubs to get you or a lady in your life a set of golf clubs? These are not a bad choice for the money.